Paramount Pictures has released the first two character posters from The Spongebob Movie: Sponge Out of Water, with more set to debut throughout the week. 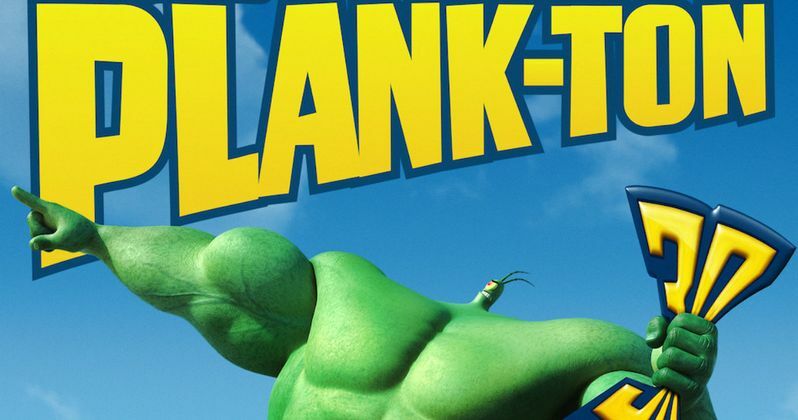 Plankton (Mr. Lawrence) and Mr. Krabs (Clancy Brown) are shown taking on much larger forms as their superhero-esque alter-egos Plank-Ton and Sir Pinch-A-Lot. Will these heroes be able to adapt to land? Or will they be like a couple of fish out of water? As we've seen in the first two trailers, SpongeBob (Tom Kenny) and his friends leave Bikini Bottom and head up to our world for the first time. Here, they battle an evil pirate named Burger-Beard (Antonio Banderas). This dastardly villain is looking for the final page of a mysterious book that will help him rule the world. Will Spongebob and his team of heroes be able to stop the evil before its too late? Or are all inlanders doomed? The first two The Spongebob Movie: Sponge Out of Water trailers do show SpongeBob and the rest of his Bikini Bottom crew transforming into these much larger, stronger characters. Though, it isn't exactly known how these transformations occurred or why just yet. At any rate, take a look at the two posters below, and check back tomorrow for the next character poster. There will be plenty more excitement ahead as the holiday weekend approaches.